Lakehaus is a fantastic 3 bedroom family holiday home featuring a fully equipped designer kitchen. Along with this entertainers' kitchen is a comparable large living/dining area featuring a large screen TV & DVD with a surround sound system (don't forget your favorite movies!). Lakehaus has ducted gas heating and air conditioning for the warmth in winter and cooling during summer. Two of the upstairs large bedrooms feature queen beds to suit and have access to the upstairs balcony with fantastic views across Lake Jindabyne to the snow capped mountains. The third bedroom downstairs has a bunk bed for two and a single for the kids. There is ample parking for 2 cars or your boat. Plus ski storage for your winter equipment in the garage. Step out onto the undercover deck and marvel at the views over Lake Jindabyne to the snow capped mountains.Enjoy a Weber barbeque with outdoor table and chairs. Lakehaus holiday home has everything you need for a great summer or winter get away. The property is located at quiet Rainbow Beach which is 5 minutes by car from Jindabyne but only 1 street away from the Lake. Crisp Luxury Linen is provided plus our deluxe soft "Bath Sheets". Helpful and kind.The host replied messages promptly at almost all time. When we asked if he could prepare fishing tools for us he did the research and provided us an A4 paper of lists, prices and contact details. The host helped us have a very good holiday experience. Wish I could stay longer time there.Its just like home on the foot of snowy mountains. It has everything we expected. We are a group of friends (4 people) on holiday there. Living in the property was just like holding a party in our own house. Thanks to Peter and his colleagues we have had a very pleasant holiday. I couldnt think of any reason for not going there next time! Team were friendly and helpful! A lovely property. Well equipped for a family winter or summer stay. Great to have an under cover garage and extra car space. We loved staying at the Lakehaus. The view was gorgeous, clean and comfortable for a real home away from home. The location was perfect for a quiet Christmas for 2 couples. Only a short drive to all the restaurants and shops in Jindabyne. Loved the walking/mountain bike trails which started just up the hill and we walk down to fish from the lakeside. Peter was great to communicate with, making the whole process a pleasure. We loved the place so much we decided to stay an extra couple of days. Fortunately the house was available and Peter and Joan were really responsive in making it happen. Thanks! The apartment is very tidy and the view outside the window is great. It's about 10 minutes drive from the nearby supermarket and restaurant. It's very convenient. The members of the team is very nice and friendly. The property is clean with a nice view. The place is what has been described and the actual lake view in the balcony is much more beautiful than in the photos. I would highly recommend this place for family travelling to snowy mountains. Will definitely come back. The house is nice and quiet. It was clean and the view is amazing. The location is only 10mins away from the restaurants & supermarket area. It was only 40 mins away to Perisher. Great location, will definitely come back next time! Thanks guys! Awesome accommodation, and you are all so friendly and helpful! Loved it... We'll be back again soon! Great welcome from staff at office. WE enjoyed the house, it had a great outlook and was very warm. It was quiet, clean, out of the business of Jindabyne but not too far away. Knowledgeable and friendly staff. All good. Good experience and everything about the property was as advertised. Was headed up to the snow for a quick getaway session. Originally informed Ray White Jindabyne that we were going to get there by 6pm but was held back and didn't get there until 7:30pm. Gave them a quick call to apologise for the tardiness but they assured us that they will still be waiting for us to pick up the keys (so that we wouldn't be stranded in the snow for the night) - couldn't have thanked them more. The property is set by lake Jindabyne and has an amazing view. The property was immaculately prepared, nicely furnished and offered everything we needed. This definitely helped make this trip one of the most comfortable getaway I have ever experienced. 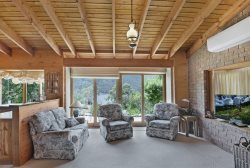 The property is set by lake Jindabyne and has an amazing view. The property was immaculately prepared, nicely furnished and offered everything we needed. Peter was delightful to talk to, knowledgeable on the area and helpful right through from booking to check out. The property was in a fantastic location with great views. The standard of furnishings and quality of house was brilliant, and it was delightfully quiet. The only fault we really had was that there was a little dog hair in the downstairs toilet and on one of the pillows upstairs. The handle inside the upstairs shower had also broken off.